VW-Ford Alliance To Spawn New Pickup, It Just Won’t Get Here Now, Later, Who Knows? Following long discussions, Ford and Volkswagen have entered into an agreement that will likely result in new vehicles, such as autonomous cars or electrics. There is also talk of VW and Ford jointly developing a global mid-sized pickup. That, though, is several years away. Ford makes the case that with pickup demand expected to grow over the next five years that it is sensible to team with another automaker, pooling resources to meet the anticipated demand. Jim Farley of Ford made the case that the trucks are for other markets, not America. Instead, South America, Europe, and Asia are their destinations. Ford Also Has A Full Lineup. Are you disappointed by this news? It isn’t as if we didn’t know. About six months ago, Torque News ran a story about a new mid-sized pickup that would slide in above the Amarok diesel pickup. The point we made that there was no intention to sell the trucks in this market. An earlier story nearly two years ago discussed the Amarok. 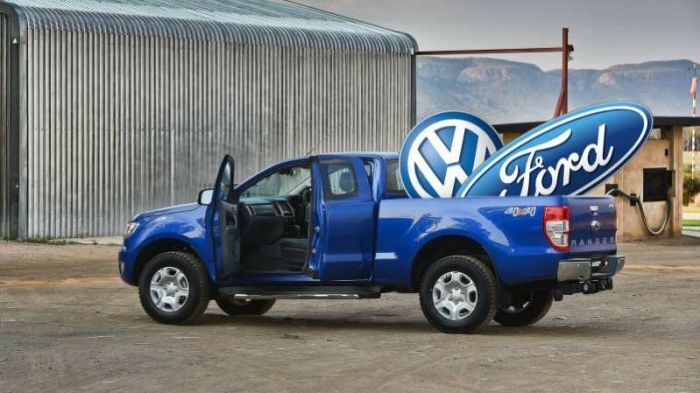 Torque News asked a Ford spokesman at that time whether there were plans to offer the pickup (Amarok) here. The answer was a firm no. The platforms that will underpin the new pickups aren’t sold here either. The Transit Custom is the basis for the “global Ranger” and other new vehicles as well., Interestingly, if you were to take a test that asks about the basis for the new VW-Ford trucks and you failed, that would not be too surprising. The Transit Custom is pretty much a Europe-only truck. You can get one here, but it takes a ton of work. “Over time, this alliance will help both companies create value and meet the needs of our customer and society. It will not only drive significant efficiencies and help both companies improve their fitness but [it] also gives us the opportunity to collaborate on shaping the next era of mobility.” Ford-VW Talks Resulting In Benefits To Both. With all of the promised cooperation between Ford and Volkswagen, it is quite likely that the spillover to the U.S. market will be quite something. VW’s engineering team is said to be putting together some very interesting electrics – slated for sale worldwide. VW Has Some Very Interestng Electric Plans But, that is all sometime in the future. Until then, there is little that we can do but watch as the new pickups are developed for everywhere but here.